Cooking with cinnamon is familiar to all of us, I am sure. Where would we be without this famous ingredient when we are baking cookies, especially at Christmas time? I relate this spice so closely to the holidays that I often place a couple cinnamon sticks in a pan of water and let it steep to make the most wonderful fragrance in my kitchen. The history of cinnamon is documented as far back as history is written. It is written about in the Bible and was used in many religious ceremonies. It was so highly prized by ancient nations that it was only used as a gift to the gods or to the high monarchs. It was way too expensive for common use. The great search for this wonderful spice had a great impact on the world. There were actually routes called “cinnamon route”. Can you imagine that today when cooking with cinnamon is so common? Cinnamon is grown in places like Sri Lanka, India, Bangladesh, Brazil, Madagascar and Egypt. The trees are grown for two years; the bark from the new shoots is harvested and processed. Once processed the thin bark is quickly dried to produce quality cinnamon. Its flavor is due to an aromatic essential oil that makes up its composition. Cooking with cinnamon is common all over the world. 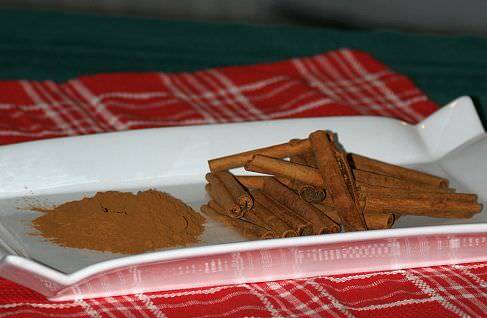 Although cinnamon may be used in many dishes like Middle Eastern Lamb recipes, it is most popular to use in desserts. Here in the United States, I cannot imagine having any kind of cooked apple desserts without the flavor of cinnamon. What about pumpkin pie? I have to have some cinnamon in my pumpkin pie. We add cinnamon to our cereal or add a mixture of cinnamon and sugar on buttered toast. In Mexico and other Spanish country almost any chocolate recipe has a little bit of cinnamon added in the recipe. Around the world cinnamon is a major ingredient in the cuisine. Through the years cooking with cinnamon and using it alone has had many medicinal qualities. It has been used to aid digestion, for rheumatism, to help with women’s monthly disorders and many more. Some people even make a cinnamon tea which they think relieves their stress. I do not know about all these claims but I do know I would not want to give up my cinnamon! 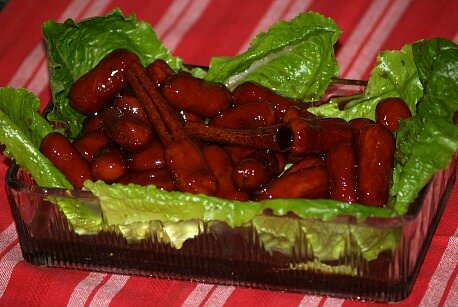 Cooking with cinnamon gives these mini weiners and extra special taste. 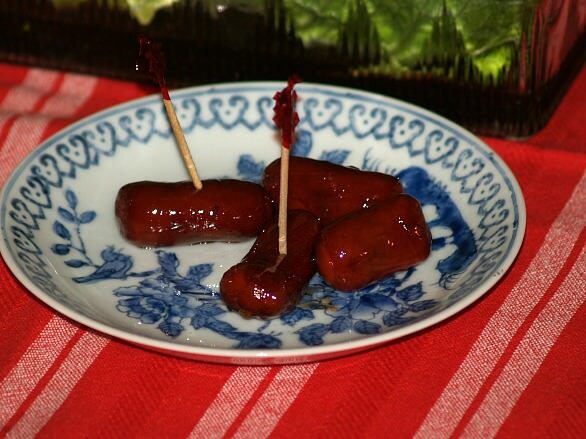 Combine in a medium saucepan jelly, soy sauce, hot sauce, garlic powder and cinnamon sticks. Bring mixture to a boil over medium heat stirring until jelly is melted and mixture is blended. Add package of wieners; boil mixture 2 minutes. REDUCE HEAT to low; simmer about 40 minutes. Steam or cook carrots in microwave until tender crisp; drain any liquid. Combine butter, sugar, honey, lemon juice and cinnamon in medium saucepan stirring over medium heat until butter melts and just begins to boil. Combine sugar mixture with carrots and cook over low until carrots are glazed; serve immediately. Cream butter and sugar together until smooth; beat in egg yolk. Add flour, cinnamon and ½ cup pecans; blend well. Press dough in bottom of lightly greased 11 X 7 X 2 inch baking dish. Brush unbeaten egg white over dough and sprinkle with remaining chopped nuts. Bake for 15 minutes, remove from oven; cut into 18 squares and bake an additional 15 minutes or until crisps. NOTE: These are good for snack or breakfast. In small bowl combine flour, coffee, baking powder, cinnamon, salt and soda; set aside. Combine and mix brown sugar, shortening and egg in a medium bowl. Stir in water and flour mixture; stir in raisins and nuts and spread in prepared pan. Bake 18 to 20 minutes until top springs back when touched in center. Drizzle glaze over warm bars; cool completely and cut into bars. TO MAKE GLAZE mix all ingredients thin enough to drizzle. Preheat oven to 350F degrees; thoroughly grease a 12 cup Bundt pan. Combine ¼ cup of sugar, pecans and cinnamon in small bowl; sprinkle half in prepared pan. In large mixing bowl beat butter on medium speed until creamy. Gradually add 1 cup of sugar while beating; continue beating for 7 minutes. Add eggs beating after each addition until blended. On low speed beat in bananas, sour cream and vanilla until blended. Combine flour, baking powder, baking soda and salt; fold into butter mixture. Pour half of batter into prepared pan; sprinkle with remaining sugar pecan mixture. Top with remaining batter; bake for 45 minutes or until a pick comes out clean. Cool on wire rack in pan for 10 minutes; remove from pan and cool completely on rack.